Spring Green Educational Foundation's commitment to an honest look at the opioid crisis and how we can change this from destroying the lives of countless others. Spring Green was created and operates under a simple belief; our job is not to judge, nor it is our job to figure out if someone is deserving of something. Rather our responsibility lies in lifting the fallen, restoring the broken and healing the hurting. We make it our Foundation's work to hold ourselves to this mantra and have been able to impact countless lives through this belief. We regularly assess the needs of our community and make it our priority to positively impact change whether it be through addiction, restorative justice, or supporting our schools to invest in the youth who will one day be leading our world. We invite you to join us in seeing the light in others, and treating them as if that is all we see. Spring Green is proud to work in partnership with organizations that support our mission of healing, restoration and creating connection throughout our community. We recognize the value of collaboration and proudly serve alongside these institutions. SGEF has hosted hundreds of Challenge Day programs throughout northwest Ohio, changing the lives of students and school staff in a powerful, positive, experiential day where students and adults are focused on connection, empathy and inclusivity. These attributes beautifully line up with SGEF’s mission and the partnership SGEF formed years ago remains strong and growing. Most recently the leaders of Challenge Day hosted a weekend workshop with participants from the Chasing Hope film and DART program to create a community that works collectively toward restoration and healing. SGEF has developed a strong relationship with the Lucas County DART (Drug Abuse Response Team) unit of the Toledo Police Department. DART works fiercely to address the number of deaths and overdoses in Lucas County related to drugs, particularly Heroin. In their work to eliminate the loss of lives and educate the public, SGEF has teamed up with them in the making of the documentary Chasing Hope as well as the Middle and High School edition of the film intended for use throughout all schools in Ohio. In both films, DART is highlighted as a resource and solution to the crisis the nation faces but particularly northwest Ohio. The District Superintendent for the United Methodist Church of the Maumee Watershed District has asked all church leaders to partner with Spring Green in the sharing of the Chasing Hope film. "As a pastor, I was extremely impressed with the emphasis on the value of life in the movie. These children and young adults are not portrayed as statistics but as precious people loved and created by God..." Scot Ocke. Through this action Chasing Hope is being shown in churches and having open and honest discussions on how to best support the healing of this crisis and move forward toward restoration. This edition of Chasing Hope (CH) which was created with the middle and high school youth in mind, goes way beyond the scope of educating an adolescent on the facts surrounding opioid abuse. After watching this film the viewer will understand addiction, why risks are so much greater in adolescence, what comes with addiction including incarceration, violence, and possibly death. 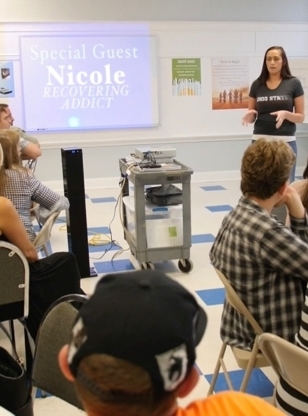 The viewer will get a chance to look at their own coping skills, how they make decisions, and learn how closely linked prescribed opioids are to heroin. Compliant with Ohio Governor Kasich’s educational requirements to teach opioid prevention, this film comes with a discussion guide which opens up a dialogue between presenters and youth for grades 6-12. Parent: It has been said parenting is the easiest thing in the world to have an opinion about and the hardest thing in the world to do. What makes SGEF's Diversion program so unique is we offer a parenting class that runs simultaneously with the teen class. Using the popular and highly success Parent Project curriculum, trained facilitators discuss discipline, dealing with the adolescent child who is defiant and offers effective tools on how to change unwanted behavior. In addition, parents will be given the latest trends teens are using among their peers as well as social media. Youth: Nothing changes if nothing changes. Simple right? Yet we get frustrated with teens when they continue to make poor choices that bring about negative consequences. Through these classes, youth will learn how to identify their thinking patterns and the direct impact they have on the relationships and circumstances in their lives. This ten-week course works on self image, decision-making, communication and so much more. Our recidivism rate is one of the lowest in the area and for good reason, we are a comprehensive program that works with teens weekly, including requiring community service hours and a social worker on staff to be sure all issues are successfully being addressed. "As a former member of the diversion program, I learned and also changed so much after going through the class. I went from being at the lowest point in my life to being the best I’ve ever been. This class not only teaches you about the effects of drugs and alcohol, but it also teaches you about manors and life guidelines to follow. I think that other people should take advantage of this program so they can also get the help they need. In the long run diversion is a great program for all teenagers when it comes to fixing unhealthy habits." Thousands of students and staff have been impacted through the Challenge Day program, which focuses on breaking down barriers that lead to bullying, isolation and oppression. Organizations have requested to use Chasing Hope for their population. Schools in 35 states have shown Chasing Hope to their middle and high school students which will serve over 10,000 students..
Parents have watched this film in hopes to show their children and create a discussion about opioids and how they cope with stress.